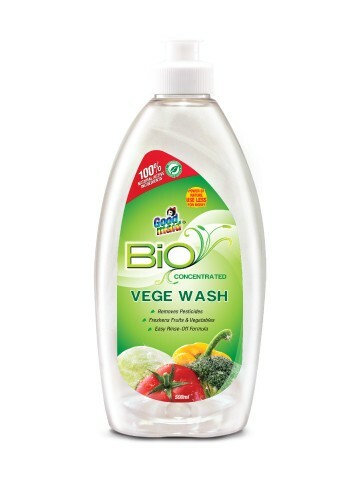 Bio Vege Wash - Goodmaid Chemicals Corporation Sdn. Bhd. An environmental friendly and biodegradable formula derived from 100% plant based active ingredients. • To remove dirt particles, chemicals and pesticide residues found on vegetables and fruits. • Cleans & removes pesticides. • Easy rinse-off formula leaves no chemical residues, making it absolutely safe. • Non-toxic : Tested and proven by USA Laboratory (Acute oral toxicity test). • Add 5ml ( 1 teaspoon ) to 2 litres of water. Soak uncut vegetables and fruits in solution for 5-10 minutes, agitate to allow through contact. Rinse under running water. • Pour 1-2 drops onto fruits and rub thoroughly. Rinse under running water.